During the fall season my favorite colors are browns and burgundies. Most fashion pieces that have graduated into my closet this fall needed to have at least one of these colors in it. Today's post is about an extremely rich color. Its vibrant and chic-nature are their most fashionable characteristics. I am talking about the color red-wine which originates from the burgundy family. One thing I have learned over the years when shopping for new jewelry pieces, is to make sure that each new piece can be easily matched-up with at least one piece from my current collection. This way I am mindful about my budget and the size of my collection. 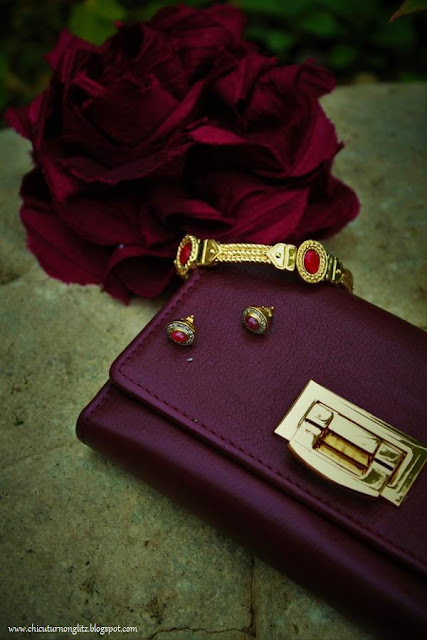 At the time of the purchase of this bracelet, I had remembered that my mother's hand-me-down pair of vintage, jewelry ruby earrings would be a perfect match for the bracelet. 1. When mixing varying shades of red, this can help make the outfit become very chic. 2. Not being afraid to mix fashion jewelry with real jewelry. Above, I am wearing my recently purchased bracelet and the hand-me-down ruby earrings. The rich, red stones on this bracelet combined with the gold coloring brings out the burgundy color of the sweater (H&M) beautifully. On my nails I am wearing China Glaze in the color Fifth Avenue. I wrapped a orange-red silk scarf around my hair. This is an example of how I love to mix different shades of reds. This cardigan is from H&M 2015 fall collection. Today I am carrying my fall crossover-purse. This purse I scored at 75%-off original price at a store that closed down this summer. Notice how the strap of the purse is slightly darker in color than the cardigan. This is a perfect example of how I love to mix different shades of red. Awesome tips, love your style and the cardigan is so chic! I love burgundy for fall and you have such amazing pieces! I adore your crossbody bag!! Love all the burgundy in this look. I never get tired of this color. Love your bracelet and your bag. Great pairings! I think gold tones always look best with reds/vines. It never crossed my mind that gold and burgundy would be such a gorgeous combo but they look fabulous on you. Love the bracelet, the design is timeless and classic! Burgundy is a beautiful color for fall and you have some great pieces here. The accessories are so chic. What a nice bracelet! This burgundy bag is such a great find! I love the accessories! So chic! I really love that wine colour, oxblood red kind of colour. Lovely bracelet! It's beautiful! Thank you for the kind comment on my blog, always trying to return the support! Totally obsessed with the wine color also. Well, and actual wine to be honest!! Wow, I'm impressed by your beauty and the beauty of your pieces! For me brown and burgundy are perfect colours for fall and thank you for the very good tips in mixing jewellery. And now I'm in love with your so wonderful and cute cross over bag! Really great post! Love the wine tones of the jewelry! I just found your blog and I really like it, so I just started following it, number 44. Such a pretty color scheme! Such lovely shades. Love the sweater! love the cardigan color so much! I love your tips! Thank for your comment on Qing's Style. Please always keep in touch! Thank you dear. :) Have a great weekend.